The C9799X4-1M is a 1 meter 30awg Madison fanout cable using QSFP+ (SFF-8436) connector on one end with green pull-tab Ejectors and four (4) SFP+ (SFF-8431) connectors on the other end with white pull-tab ejctors. This cable is used for InfiniBand and 10GB applications. 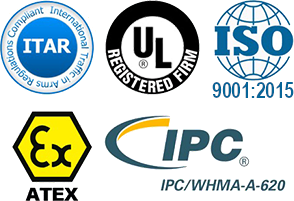 This cable is RoHS compliant.. The C9799X4-2M is a 2 meter 30awg Madison fanout cable using QSFP+ (SFF-8436) connector on one end with green pull-tab Ejectors and four (4) SFP+ (SFF-8431) connectors on the other end with white pull-tab ejctors. This cable is used for InfiniBand and 10GB applications. This cable is RoHS compliant.. The C9799X4-3M is a 3 meter 30awg Madison fanout cable using QSFP+ (SFF-8436) connector on one end with green pull-tab Ejectors and four (4) SFP+ (SFF-8431) connectors on the other end with white pull-tab ejctors. This cable is used for InfiniBand and 10GB applications. This cable is RoHS compliant.. The C9799X4-5M is a 5 meter 24awg Madison fanout cable using QSFP+ (SFF-8436) connector on one end with green pull-tab Ejectors and four (4) SFP+ (SFF-8431) connectors on the other end with white pull-tab ejctors. This cable is used for InfiniBand and 10GB applications. This cable is RoHS compliant..
QSFP+ / SFP+ x 4, 1M, Artista. QSFP+ / SFP+ x 4, 2M, Artista. QSFP+ / SFP+ x 4, 3M, Artista. QSFP+ / SFP+ x 4, 5M, Artista. QSFP+ to SFP+ x 4, 1M, Cisco Compatible. QSFP+ to SFP+ x 4, 2M, Cisco Compatible. QSFP+ to SFP+ x 4, 3M, Cisco Compatible. 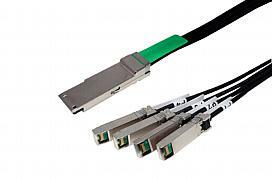 QSFP+ to SFP+ x 4, 5M, Cisco Compatible. QSFP+ to SFP+ x 4, 7M, Cisco Compatible.